My irrigation is pretty much on autopilot. 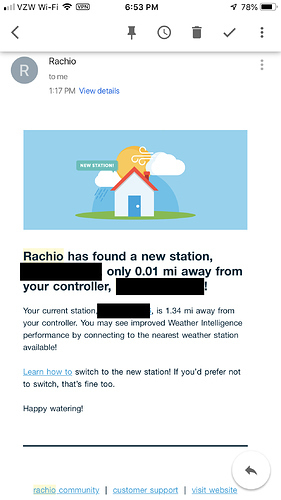 Sure, I run my zones manually every once in a while to check coverage and swap out spray heads/adjust rotors from time-to-time, but mostly it just does its thing, thanks to Rachio. That’s why its nice when I can still be pleasantly surprised by features that Rachio included most users might not even get to experience. Exhibit A - My weather station provider was experiencing some instability in pushing data to Weather Underground. It was a known issue and they (Ambient Weather) were pretty good about communicating with the community on progress towards a fix. So I wasn’t surprised when the weather station Rachio uses stopped reporting data. 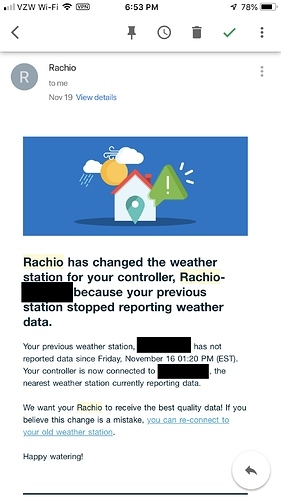 Exhibit B - Normally, if a schedule is set to run and there is rain in the forecast, rachio will do a rain skip if all conditions are met. However, on this particular day, the schedule was set to run and there was no rain in the forecast. Sure enough, no sooner did the schedule start when it started raining, HARD. 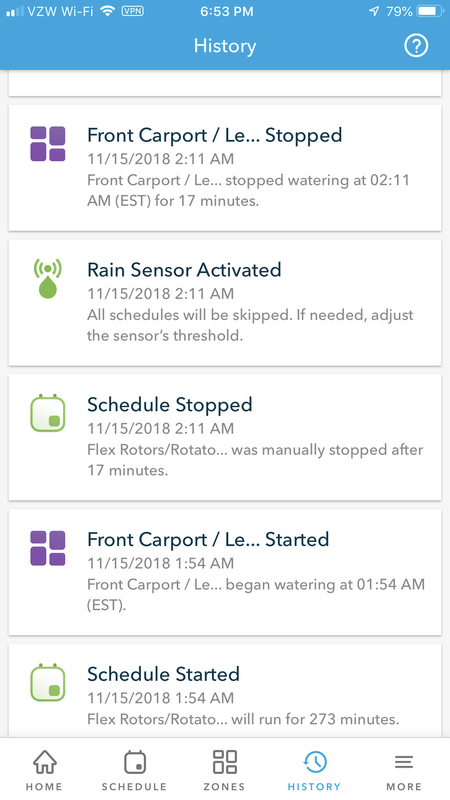 I have a hunter rain sensor wired into Rachio, which tripped after 1/4 inch of rain, which promptly shut off the schedule only 17 minutes into a 5 hour watering. Great illustration of the water saving features Rachio provides. Now that my flow meter has been installed for >6 months I’ll be posting (at a later time) a more complete analysis of water savings I am compiling to combat my HOA’s wonky watering restrictions. 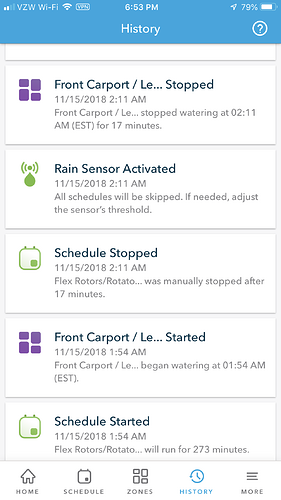 My hypothesis was that by using Rachio to water on any day the grass needs it (MAD), I will use less water over time than watering the HOA mandated 2x a week on pre-determined days. What a cool story, thank you for sharing! The “self healing” weather station feature is new to this season, you can thank @franz for that . I am excited to hear about your Flex Daily usage experiment!! I agree with everything you mention. It’s such a solid product! I’m only on my first year with it, but I am extremely impressed with how well it worked this past summer. I’m hoping Rachio has many more products up their sleeves!